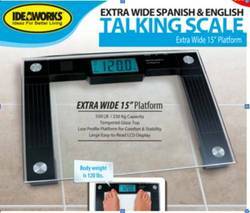 Extra Wide English and Spanish Talking Scale 550 lb limit. Bilingual – Spanish and English. Pleasant and easy to hear voice. Extra large, stable weighing platform. Tap on and off functions. Low battery indicator8 mm tempered glass.